One in a thousand chairs Written on December 12, 2008, by Ingeborg. Ward van Gemert likes to break things. Analyzing and arranging the parts brings him to a new re-use: reconstructivism. Exploded Chandeliers where the wire is also the backbone, a Stretched Table. 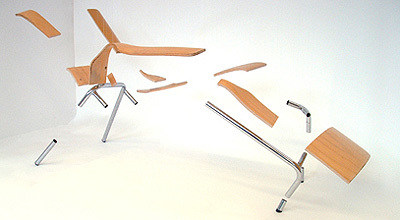 His Exploded Chair shows an infinite range of new design originating from a standard canteen chair. He even managed a chaise longue by Corbu. Remember the Exploded formula 1 car?